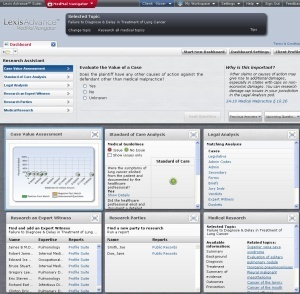 As I’ve noted before, LexisNexis is engaged in an ongoing project to standardize a range of products on the look and feel of Lexis Advance and to better integrate related products and services. 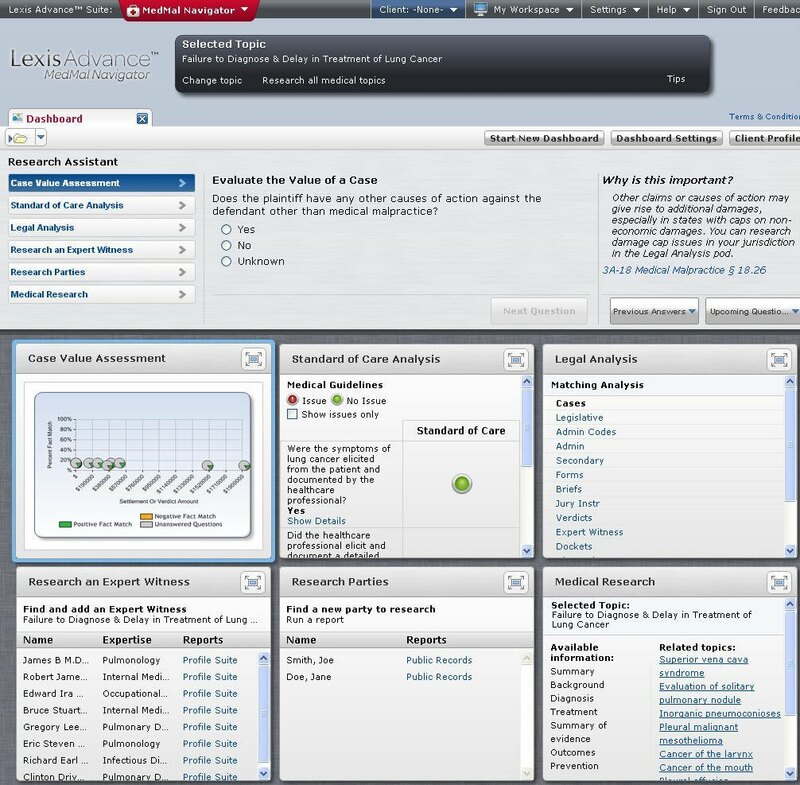 Towards this end, LexisNexis rolled out several new litigation-related tools at LegalTech, all with the theme of drawing together in a single suite various useful tools. One example is the new Litigation Profile Suite, which purports to be a one-stop shop for searching critical information about the key players in a case, including expert witnesses, judges and opposing counsel. It includes information derived from over 100,000 full–text transcripts and more than 40,000 expert witness curricula vitae and resumes. The MedMal Navigator dashboard (click for larger). But to my mind, the most impressive of the new offerings is the MedMal Navigator, an interactive medical malpractice “dashboard” that not only draws together a broad array of medical and legal research content, but that actually walks attorneys through a case-evaluation process that helps answer key questions about a case, including its potential value and the appropriate standard of care. 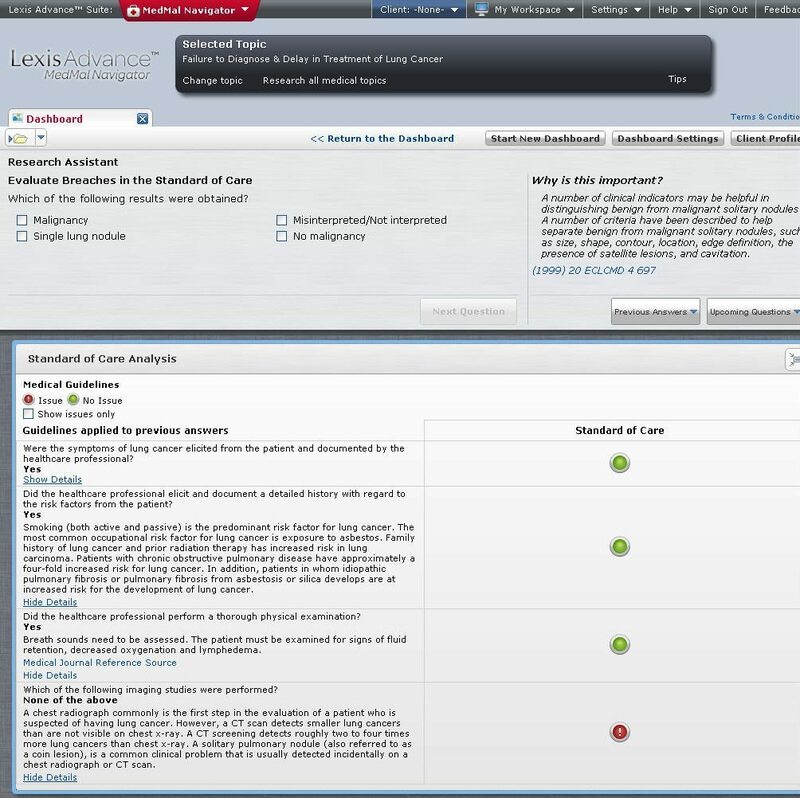 Accessed from within Lexis Advance, the MedMal Navigator includes access to health and medical information from LexisNexis’s sibling company Elsevier, one of the world’s leading publishers of scientific and health information. Information usually used by doctors and hospitals, this is the first time it is being made available to this extent to the legal community. The medical information accessed through the MedMal Navigator continues to be hosted by Elsevier, meaning it is always up to date. The Navigator also incorporates verdicts and settlements information, so that attorneys can find out how similar cases fared, and expert witness information, so that attorneys can research experts by disease, condition and jurisdiction. (Verdicts and settlements are not available for all 50 states, but they do cover the most populous states, including New York, California, Florida, Texas and others. Q&As guide lawyers through standard-of-care analysis (click for larger). Perhaps the coolest feature of the MedMal Navigator is its interactive Q&A technology. By walking you through a short series of questions about the facts of your case, it helps you find the most pertinent medical and legal research. 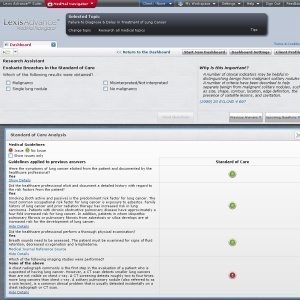 This includes a Q&A tool for analyzing the appropriate standard of care for your case, using information created by doctors expressly for LexisNexis. While at LegalTech, I had the opportunity to meet Yogi Arumainayagam, the engineer who directed the development of the MedMal Navigator. Formerly a director of product planning and development at Thomson Reuters, he described the extensive work and thought that went into the development of this new tool. I was given a demo of MedMal Navigator but did not test it directly. I am not familiar with anything on a par with this for med/mal lawyers. From what I saw, I would think that any lawyer who practices med/mal regularly would, at a minimum, want to check this out.